Wetland launched into (a new) space! 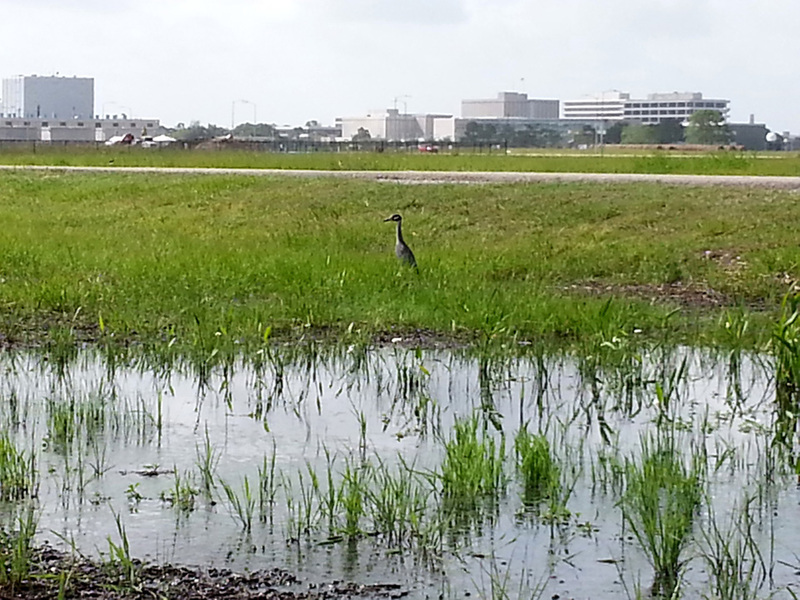 A Yellow-crowned Night Heron stalks the new wetland on the grounds of the Johnson Space Center. Visiting the Johnson Space Center (JSC), you probably anticipate a vision of a high tech future in space. But to address a more down-to-earth aspect of the space center’s operation, Chris LaChance and I were invited to NASA by Sandy Parker of the JSC Environmental Office to consult on transforming a landscape problem area from boggy lawn to JSC’s first created wetland. The JSC landscape maintenance contractor, Prodyn EPES, needed a way to deal with the water that pooled in a low spot between a weather station building, parking lots, and a jogging trail. It tended to be too wet to mow, so something else had to be done—and done on a tight budget. At about 2200 square feet, it was too large to be economically practical as a rain garden, which can sometimes require considerable excavation, an underdrain, porous soils, and a selection of predominantly nursery-raised native plants. Chris thought the site had more potential as a created wetland, so she brought me along on the mission. As we travelled across campus to Prodyn EPES, I noticed the rocket ships, of course, but I also took a mental inventory of the landscapes along the way. The north side of the campus is less developed and, except for the collection of spacecraft, resembles the J.M. West Ranch that it once was. Prairie chickens, longhorns, and rolls of hay are raised here. Because it is flat coastal prairie land, you will see “rural” roadside ditches here too. Being a wetland specialist, it’s a reflex for me to check out drainage ditches. What I saw growing in the ditches at JSC are native wetland plants—nice stands of them in a variety of species. I realized they would be the answer to the project’s budget constraint. If the plants could be collected at JSC and replanted onsite, there would be no additional expense for plants. Conveniently, many wetland species can be dug, divided, and replanted in moist soil with hardly a dent in their growth rate or survivability. Here the grounds are ready to plant. 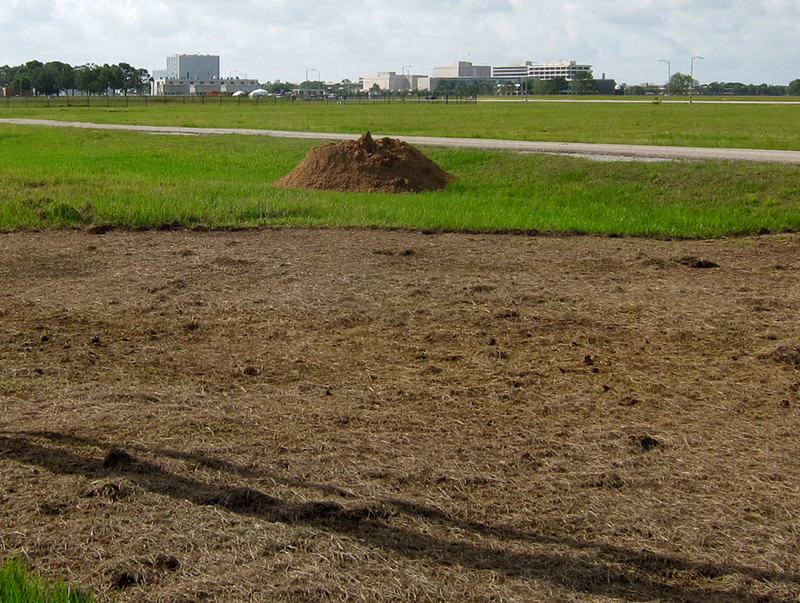 Chris advised the landscape contractor at Johnson Space Center, Prodyn EPES, on soil preparation. On a return trip I showed Prodyn EPES head gardener Aloisa Jones how to identify and plant wetland species already growing at JSC. We collected or flagged about 20 varieties. The wetland was planted in late June and barely three weeks later, it showed signs of becoming established. No longer will this boggy area require mowing, risking muddy ruts or worse, a mired tractor. Evapotranspiration removes a surprising amount of water through the plants as well as off the surface of the wetland. This reduces excess rainwater naturally. Instead of a waterlogged lawn, JSC has a piece of improved habitat already attracting herons, plovers, and dragonflies. (L to R) Learning the wetland plant species discovered in the ditches at JSC. Two views of the wetland showing how quickly the plants have established. We hope that a precedent has been set for beneficial ways of managing excess rainwater with projects like this, at NASA and elsewhere on the Gulf Coast. After all, before the Space Age, much of these lands were once marshy coastal prairies. Sometimes it doesn’t take much to encourage them to flourish and work on our behalf as wetlands once again.